Over the past year I have found myself connecting flights in Istanbul numerous times, and whenever the opportunity presents itself I like to squeeze in a visit to stroll the streets and eat some baklava even if it’s just for a few short days. 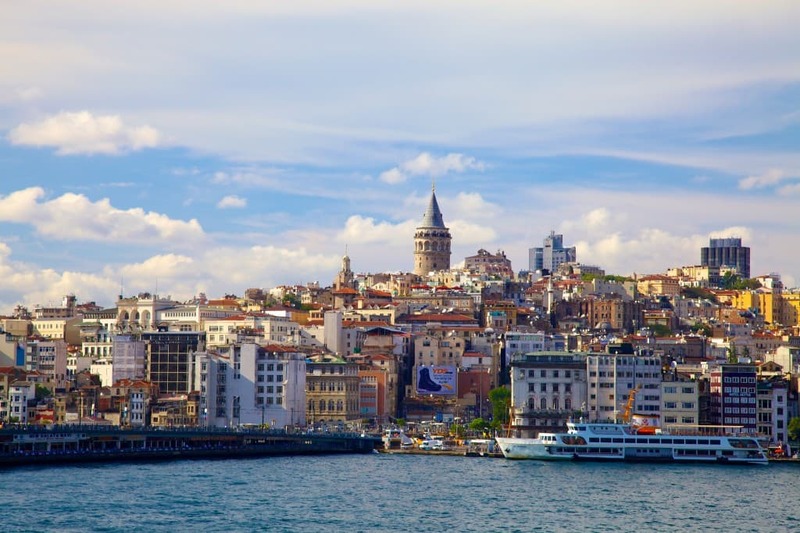 Yes, Istanbul is a destination where you could spend weeks on end, however, today I’m sharing an itinerary for weekend visitors or travellers in transit who only have 48 hours to spare. 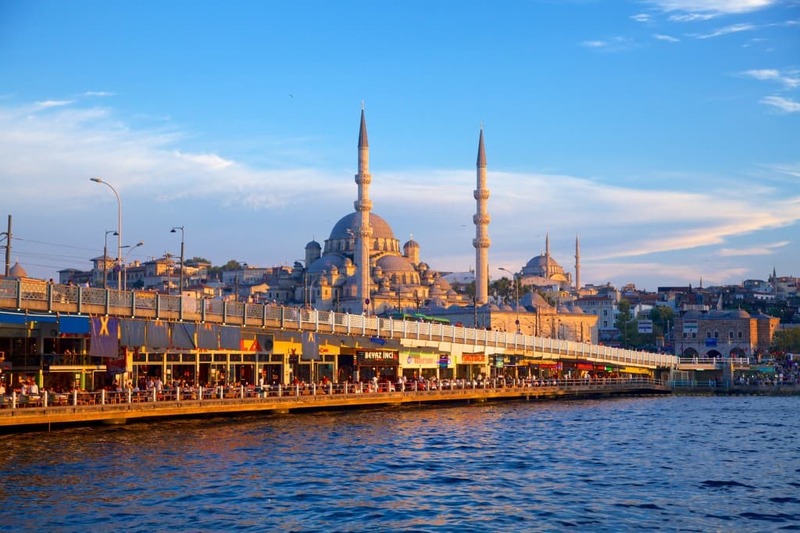 You won’t see it all, but you’ll certainly get a taste of Istanbul’s main attractions. 8:30 a.m. Enjoy a delicious breakfast at your hotel in Istanbul. You’ll need the energy for an action packed day. 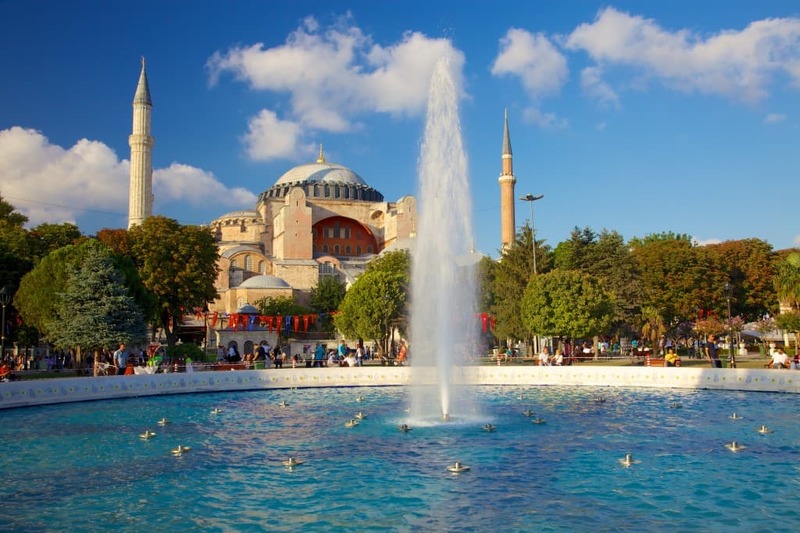 9:00 a.m. Start off by visiting one of the city’s most famed attractions, Hagia Sophia. This architectural marvel is steeped in history; it first opened its doors in the year 537! It’s mind-blowing that we can still experience it today. 10:30 a.m. From there it’s a skip and a hop over to the Sultan Ahmed Mosque, better known as the Blue Mosque. 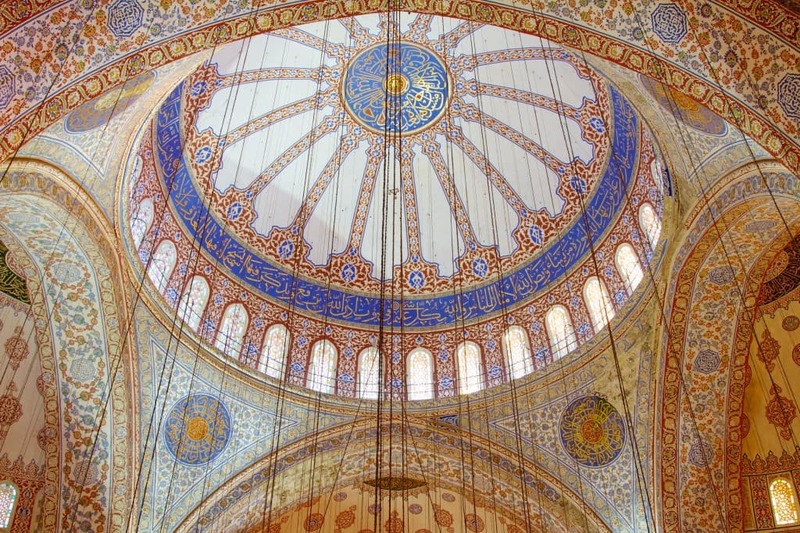 The mosque gets its name from the blue tiles that adorn the interior of the building. 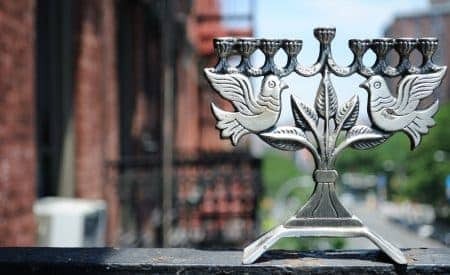 This is an active place of worship, so you’ll have to dress modestly when you visit – no shorts or sleeveless shirts are allowed, and a head covering for women is necessary. You will also have to remove your shoes at the door. 11:30 a.m. Sneak in one more attraction before heading to lunch. 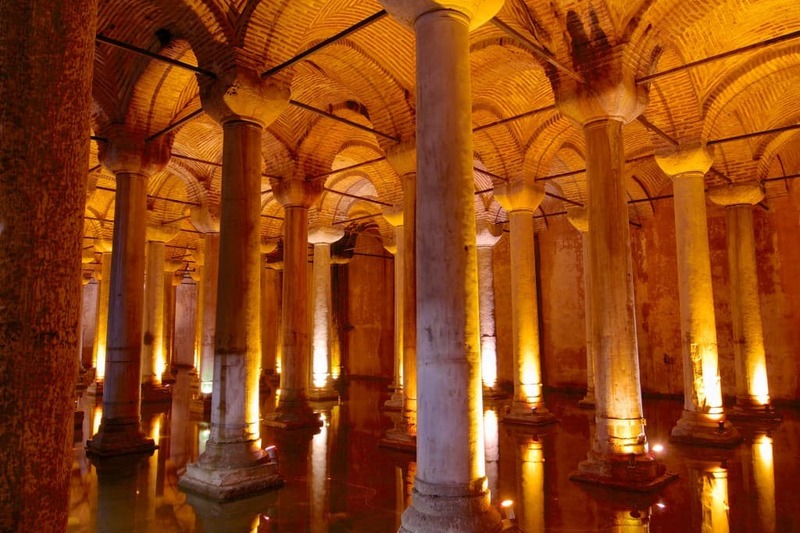 The Basilica Cistern is just a few steps away and it’s really neat going underground into this ancient water reservoir. 1:00 p.m. There are lots of great restaurants to choose from in the historic Sultanahmet district you’ve been exploring, so take your pick. Most restaurants will offer a sampler platter that comes with kebabs, ground beef, grilled vegetables, and other staple dishes. In my experience, Turkish portions are very generous in size so bring your appetite! 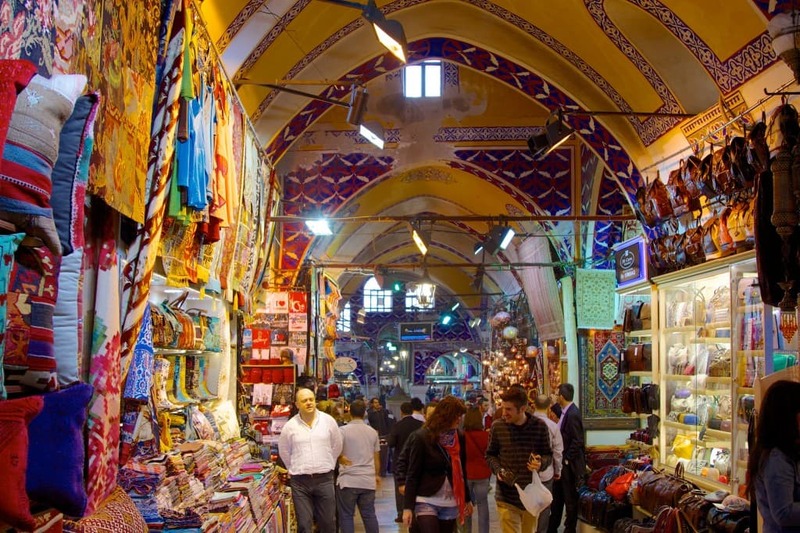 2:30 p.m. After that delicious meal, take some time to wander around one of the world’s oldest and largest markets, the Grand Bazaar. There’s no way you’ll be able to see it all as this market is made up of over 3,000 shops, however, you should be able to find some treasures to take back home. Also, come prepared to bargain, it’s all part of the experience! 4:00 p.m. For a little afternoon pick me up, go to Hafiz Mustafa for a cup of apple tea and some Turkish delight. If you have a sweet tooth, then this will be your idea of heaven. They have unique and delicious flavours including cinnamon, rose, mint, pomegranate, and kiwi. Simply delicious! 5:00 p.m. You might be starting to feel a little weary after a long day of walking; this would be a good time to go back to your hotel, have a quick nap, and freshen up for your first night out on the town. 7:00 p.m. Make your way over to the Hodjapasha Dance Theatre to watch a whirling dervish dance. This dance is an important part of Turkey’s culture and heritage, and the ceremony is said to free the soul and elevate it closer to God. It’s a mystical and entrancing experience. 8:30 p.m. 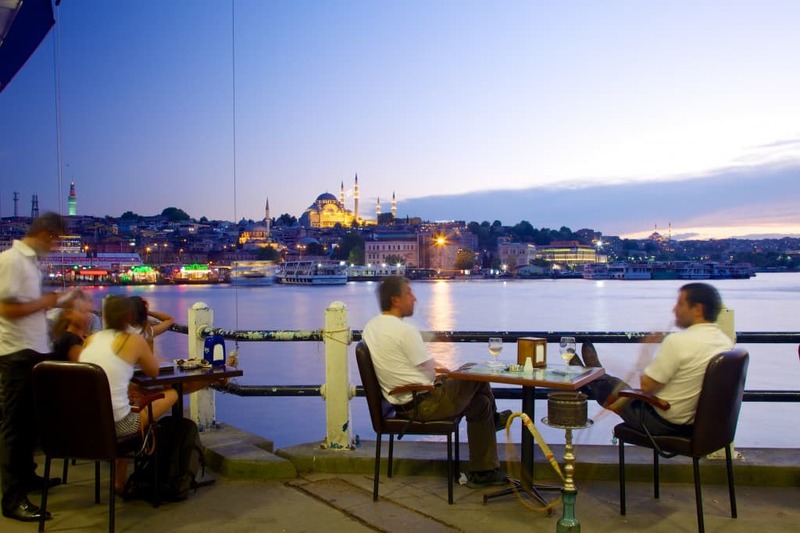 Finish off your first day in Istanbul with dinner. If the weather is nice, you may want to consider dining al fresco so you can soak in the city all lit up at night. Alternatively, you could enjoy a dinner cruise on the Bosphorus. 9:00 a.m. Go for a walk along Galata Bridge and watch as men spend their morning fishing. I think this is one of the best places in the city to soak in that quintessential Istanbul skyline dominated by domes and minarets. 10:00 a.m. From there head on over to Galata Tower. 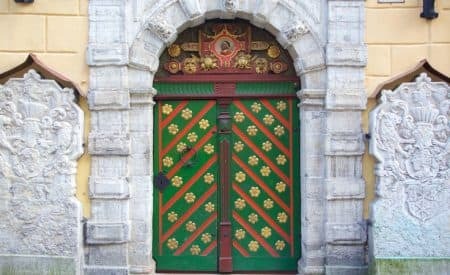 The structure looks straight out of a fairy tale and you’d almost expect to see Rapunzel’s head peeking out. An elevator will take you all the way to the top, from where you can enjoy more panoramic views of the city. 11:00 a.m. Istiklal Avenue is one of the most famed avenues in Istanbul. This pedestrian friendly street is lined with boutiques, antique shops, cafes, restaurants, and all manner of stores. It’s a really nice area to leisurely enjoy on foot. Alternatively, you can hop aboard the old wooden tram, and that will transport you the full length of the avenue. 12:30 p.m. If you’re ready for lunch, I suggest finding a little restaurant that serves kumpir. This dish is essentially a baked potato, but you can load it with all sorts of toppings including sausage, mushrooms, pickles, cheese, bulgur, peas, and more. It’s incredibly filling and seriously delicious. For dessert, treat yourself to some Turkish ice cream. It’s a bit stickier than your average ice cream, so the ice cream scoopers will have some fun teasing you with an upside down cone. 2:30 p.m. Take a boat tour of the Bosphorus. The Bosphorus Strait is the dividing line between Europe and Asia, so you’ll be able to soak in the sights along each of the two continents. Pretty cool if you ask me. 5:00 p.m. Swing by the Istanbul Archaeological Museums. The complex consists of 3 museums: the Archaeological Museum, the Ancient Orient Museum, and the Tiled Kiosk Museum. There are some fascinating sculptures and sarcophagi in there, so if you like art and history it’s worth the visit. 7:00 p.m. Enjoy one last dinner in this magical city and say farewell as the skyline glistens in the night. What would you want to see with 48 hours in the city? Samuel Jeffery is a travel blogger and YouTuber who has been exploring the globe for almost a decade. His travels are fuelled by a hunger for new exotic foods and a sense of adventure. You're likely to find him sampling fried critters in Southeast Asia or hiking through rural parts of South America. Look for the man with red hair and a camcorder in hand, because wherever he goes, he has to get it on video! This sounds like a great trip to experience a variety of some of the city’s highlights! It’s a lot in a short period of time! 48 hours definitely isn’t a lot of time but luckily a lot of the main attractions in Istanbul are not far from each other.